Have you ordered fabric thinking it would be fabulous for you but when you open the box it turns out it is fabulous for someone else? This is what happened with this fabric from Emma One Sock, I loved what I thought was a soft pink on my monitor and in reality it is a neon pink. Last Sunday afternoon, I said to Meredith, who loves the neon colors, I will make you a sweatshirt using McCall's 6992 and this fabric, okay? Meredith wasn't quite sure about it, the fabric was maybe too bright for her. 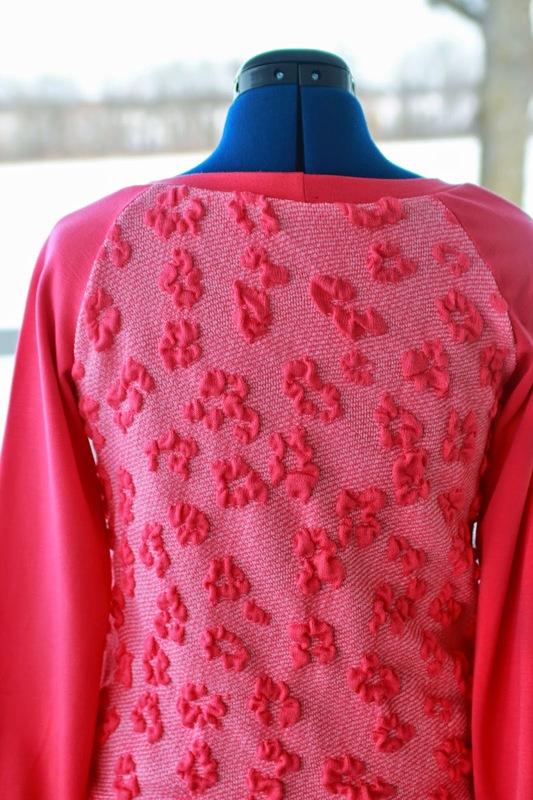 We both loved the fabric and the texture and my plan when I ordered was to use the texture fabric for the sleeves, too. One thing I love about Emma One Sock is how she lists possible coordinates for the fabric. That is how I got such a perfect match for the solid with the sweater knit. After thinking about it, I said to her, "what if I just use the texture fabric for the body? I think I have enough of the pink ponte for the sleeves." She was great with that idea. Off Meredith went back to college and I went to work on this sweatshirt. Meredith is 5'9" tall with long arms, so I added 1" to the body and 1-1/2" to the sleeves. As you can tell I was able to get the sleeves and bands out of the solid pink. One nice feature on this McCall's pattern is neckline darts in the top of the sleeves. It pulls in the neckline width on a raglan style, another good feature for Meredith as she has more narrow shoulders. This top took no time to sew and I love how it looks with fabric combinations. Usually, I coverstitch around the neckline, just a nice finishing feature. I eliminated it for this fabric, I thought the high texture of the fabric would interfere with a nice smooth coverstitch. I did splurge on this fabric, it was so fun I just had to have it. Have you splurged on gotta have it fabric? I was thrilled when I completed the top and sent a picture to Meredith. The responding text was "It turned out much different than I thought it would. I love it!" That made me feel so much better after my splurge. This photo shows the texture and represents the truest color of the fabric. One more finish shot of the fashion sweatshirt, which I love for Meredith, it fits her style perfectly. Kaitlyn has put in an order of one and selected some fabric from Girl Charlee, which I will order tomorrow. When Meredith wears this top, I will take a picture and put it on my Instagram account so you can see it on her. Now if you have read this far, I have a giveaway for you. Since I didn't cut sleeves from the textured fabric and I ordered a bit too much, I have just over 1 yard to give away. Leave a comment about what you might make and I will draw a winner on Sunday. 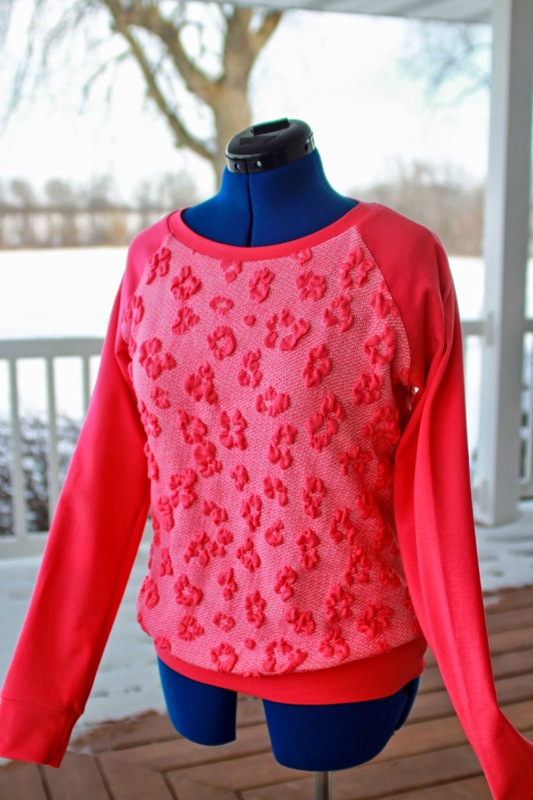 If you can't wait to Sunday, here is the link to the coral pink sweater knit or you can get it in black. I think I would make a similar top for me! I think I would make a crop top for my college girl - or a sleeveless shell for me! I would make a sweat shirt for me :) Thanks for the give-away! I would make a shirt for one of my daughters. I think I'd use this top pattern too. It's in my stash! FWIW, I love emmaonesock fabrics and I'm always browsing her site. But her fabrics are pricey and sometimes I can find the exact fabric elsewhere for a lot less. I'd make a peplum tunic for my daughter. I would mix it with another fabric to make a sweatshirt just like yours! Oh, I love this sweatshirt! Great idea combining the two fabrics like you did. I'm in with its great as it is and I would make a sweatshirt too. What a gorgeous texture on this fabric! I'm glad that your daughter gets to enjoy its beauty and your craftsmanship. I absolutely LOVE this fabric! I already have the pattern but need the fabric...ahemm, :-) I live in the snowy Midwest and live in sweats whenever I can. I am a college professor and sweats are not work appropriate. However, this is so gorgeous and doesn't look like a "sweatshirt". I think I could probably pull this off on casual Fridays. Thank you so much for a great blog and the chance to win this lovely fabric! Wow, I love how this turned out! Bright pink is my favorite color, I'd probably use it as a sweatshirt front as you did. This is an awesome knit. I've made this pattern once and really love the pattern. It's a great sweatshirt for a college kid. My daughter (9) would love this fabric and I have great knit patterns just waiting for a great fabric! How cute! I'd make a similar sweatshirt or top, combining different fabrics and textures. Another beautiful job, Lori! I would make a sweatshirt like yours or a sleeveless top for summer. Your sweatshirt looks great! You've done a great job on this top. That is beautiful. I am inspired by all that you make. I think I would use the fabric as the front panel of a dress. Thank you for sharing! Given our California weather is going to hit the 80's this weekend, I would make Megan Neilson's kimono top. I think I will try your sweatshirt in one of the quilted knits. Thanks for the idea! What a great sweatshirt! I'd be copycat if I can find fabric to match. Otherwise, I think that the fabric would make a great sleeveless Plantain. Love the color. Both daughters would jump at the chance for a sweatshirt from this. Please DO NOT put me in the drawing. Yes I would like it. I just went to Mood to order some. And came very close to buying it. But no. I have way too much stash and I'm sewing plenty now. Just wanted to tell you I love your sweatshirt!!! 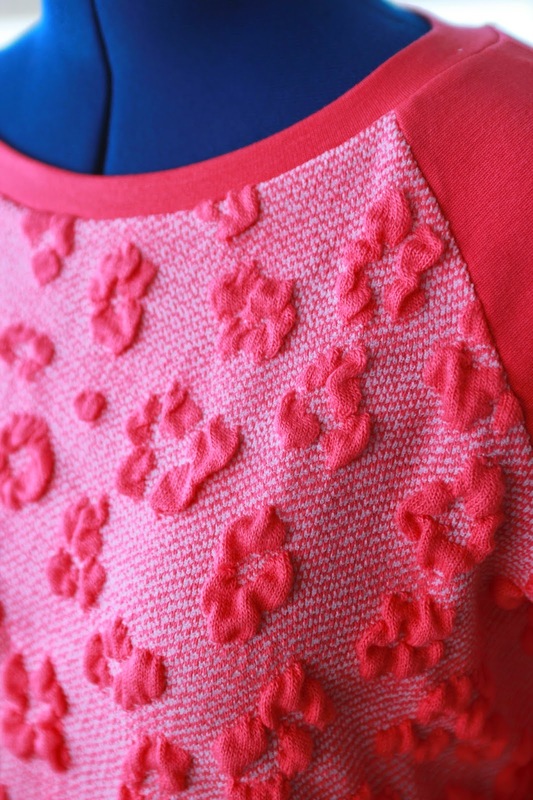 The textured knit is awesome and contrasting coral pink you used is perfect. Wow, this turned out gorgeous!!! I really, really like it! You can leave me out of the giveaway- I suddenly feel like I'm drowning in fabric- but I just wanted to tell you how cute I think this is!